Are you ready about today’s dose of fashion update, who’s hot & who’s not? Who glazed the stage? Stage? Where? ● We will do a fresh start from the elegant girl who won the “Fresh Face of the year” award, the zingat girl of bollywood, the elegant and upcoming superstar Jhanvi Kapoor, she wore a beautiful gown by Ralph and Rasso with feather detailing, styled by Rhea kapoor and we are sure she is going to fly high. ● The next gorgeous lady is Sonakshi Sinha, the girl who brought all the gold and shimmer on the red carpet by wearing a shimmery golden gown in mermaid silhouette and looked completely ravishing. ● The next spot is acquired by the feminine beauty, Dia Mirza, she wore a red color gown by Nikhil Thampi with the detailing of metallic belt on the waist, it added extra points in her look. ● She proves that age is just a number everytime she makes a public/social appearance, she is the fit and fabulous Mandira Bedi, she wore a beautiful ensemble in black by the designer duo Monica and Karishma, their brand is known as Jade. ● Standing tall like her height, the next is Bollywood’s tigeress Katrina Kaif, she looked red hot and sizzling in a red wrap around dress with a thigh high slit by the london based designer Ong Oaj Pairam. ● The girl who is making everybody dance with her moves, the stunning dancer and actress Nora Fatehi, she looked sassy in a one shoulder black dress with a thigh high slit on one side and sheer detailing on the other by the designer Gavin Miguel. ● The next is the talented actress of the famous series Sacred Games, Kubra Sait , she wore a gown by designer Alpana_Neeraj with a pleated ruffle detailing at the waist, plunging neckline and a beautiful smile. 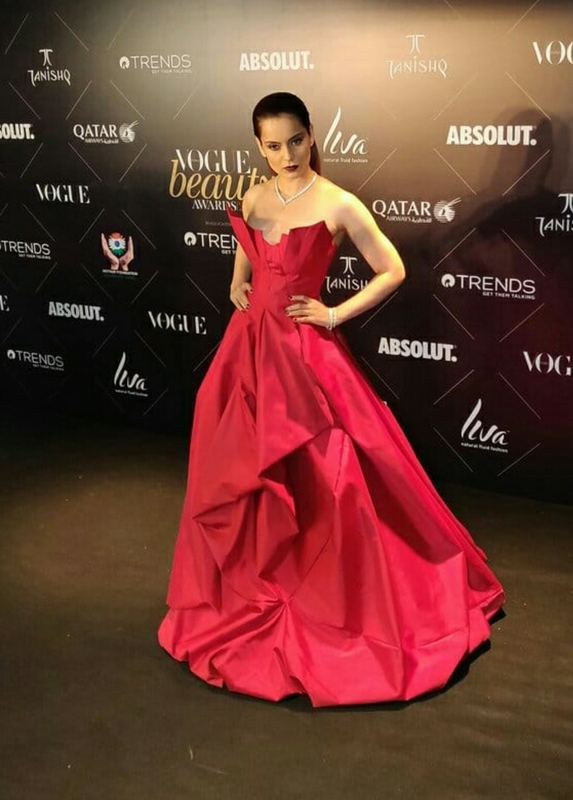 ● We saved the last spot for the bold and beautiful Kangana Ranaut, she not only won the beauty of the year but also won our hearts too by wearing a red color, off shoulder gown the designer Gaurav Gupta, she looked breathtaking. That’s all from Metroholica today, we will be back with our next post soon, till then…..Be Fashionable…!! !